Final reminder that the club AGM will take place in the clubhouse starting at 1700 hours. It’s not too late to stand for a committee position if you wish. Just download a nomination form (click here), get a proposer and a seconder to sign it, add your own signature and hand into the office before the meeting. If you intend to stay for a meal after please put your name on the list displayed at the hatch as soon as possible, or speak to Martin in the office tomorrow or Helen by phone. Helen Johnson is now running the catering. Many thanks to Fay, Rob and their many helpers for a splendid service since she took it on some 8 years ago. Yesterday was the official first day of Spring. Also known as the Vernal Equinox, yesterday marked the time of year when day and night are most nearly equal (roughly 12 hours each). The Spring Equinox always falls on March 19, 20 or 21. So life just gets better and better for the next few months for us glider pilots and the weather this week and the forecast for next week back that up. Should see some thermal cross country flying very soon. Our new Junior made its first flights at the Mynd this week. Its not dissimilar to the K23 but a more defined taildragger so it needs to be held off properly. It has brakes like barn doors and is roomy and comfortable to fly. So all you people who complained that the Discus was sooooo uncomfotable should form an orderly queue to get the Junior in your log book. Don’t forget you need to do a type conversion first. A memorial event will be held at Lasham Airfield on Friday 26th April at 14:00 hours. It will be a non-religious ceremony to celebrate Derek’s life. All will be welcome to come and pay their own respects to one of the world’s greatest aviators. The event will last for an hour to an hour and a half and will be held in the Brown Elephant building at Lasham. Please inform anyone else you know who may be interested, especially anyone of DP’s era. If you would like to attend, please can you let the girls in the office at Lasham know. They will need to know numbers so please phone 01256 384900 or e-mail the office@lasham.org.uk a.s.a.p. Still looking for a volunteer to help with Press and Media Relations. It isn’t a committee job and just requires someone who can keep in touch with events at the club such as new solos, visiting, expeditions, special events etc. and write a decent Press Release and a Twitter/Facebook post, circulating to the relevant press and media operators in our region. If we are to grow the club and attract new members this is a vital role. It could be shared amongst a number of volunteers. That’s all for now. See you at the AGM. I was at the AGM yesterday. We’ve not met before as I generally fly mid week and only moved locally to BC and Mynd last year. If you send me your list of 20+ article tropics I’ll see what I can do for the magazine. I went solo at Doncaster 50+ years ago, had a big lapse but have now restarted and fly the club’s single seaters regularly. 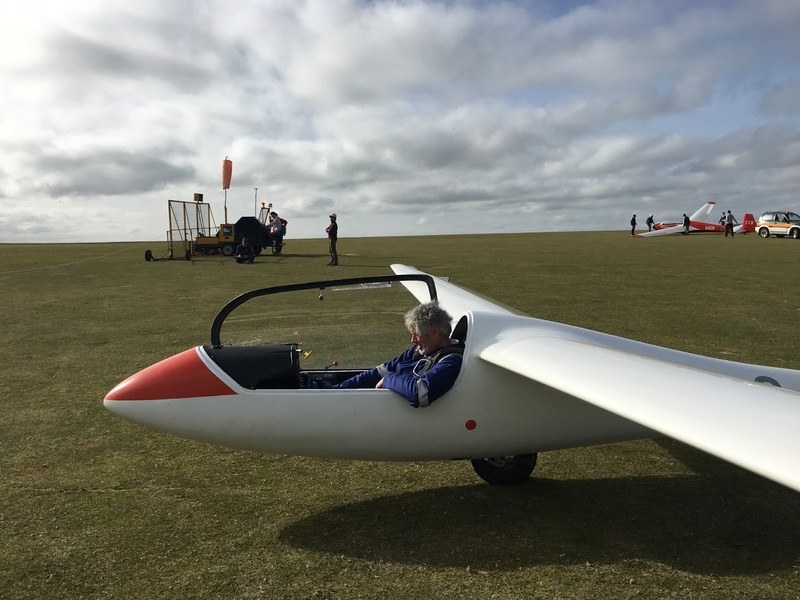 So as gliding is my main passion, I might have something interesting to write about.